A common trend for many consistently good teams is they don't have to re-build, they simply re-load. This principle appears to apply to the 2019 Euclid girls squad. Initially, followers of the program might have worried about their opportunity for success this season with the departure of all-state sprinter Caisja Chandler to graduation. However, enter into the equation freshman Alexis Cain. Categorized by coach Larry Nosse as, "a 200m and 400m specialist," Cain seems to have all the makings to become Chandler's successor. Despite her freshman class status, she's actually quite experienced relative to her same-age peers. Her stellar middle school career was highlighted by a runner-up showing at the State Championship in the 400 dash and subsequent to that, she took on a busy AAU schedule this past summer. Additionally, last year as an 8th-grader, Cain qualified for the NEOITC All-Star Championship and she gained invaluable experience by competing against the region's best athletes at the SPIRE Showcase. Her current pr's of 25.4 in the 200 and 57.4 in the 400 indicate that the sky is the limit. According to Nosse, "Alexis has the potential to be one of the best Lady Panthers ever." And this is coming from a veteran coach who has guided the likes of the aforementioned Chandler, who now represents the University of Cincinnati Bearcats, current Euclid junior stand-out Kristan Ross, as well as former team members Paris Campbell, Tamica Harbour and, of course, the legendary Jessica Beard. So aside from the natural talent, which is obvious, what are some of the intangibles that make Cain so good so soon? As Nosse puts it, "her work ethic, positive attitude, team-first approach and unwavering belief in herself are the qualities that set her apart." He believes she'll run 55 seconds this season in the 400 and beyond that he feels as though she can not only qualify for, but actually contend at the State Championship meet in March. Whether or not she fulfills those lofty expectations, only time will tell. From what we know so far about Cain, though, she's mainly concerned with helping her team succeed. With the leadership of the upperclassman, Ross and the influx of new talent with Cain and fellow freshman, Jade Neal - the future looks bright for Lady Panthers track. 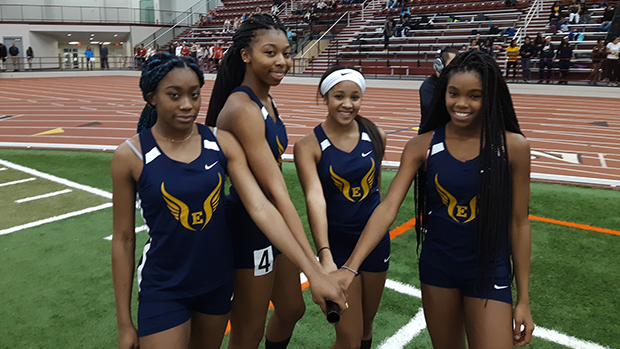 Alexis Cain, far right, is a key member of Euclid's 4x200 relay team.